Seating is limited to 200. Tickets are $10.00 in advance, $15.00 at door (if available). Row House Members plus one guest are always free. Join here for $10 or more a month. Coffee and light fare provided. What did you expect from The Row House? Dr. Makary will present an engaging talk, field questions, and sign his new new book. In this rare Central PA appearance, we are expecting a timely discussion with far-reaching effects not only for health professionals, but also for every one of us. 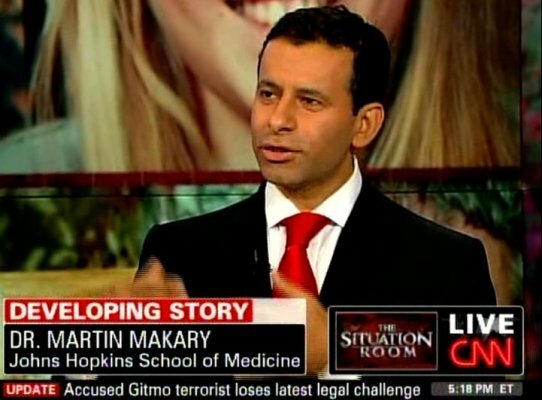 Marty (here’s his Wikipedia page) practices surgical oncology and advanced laparoscopic surgery at the Johns Hopkins Hospital and teaches public health policy at the Johns Hopkins Bloomberg School of Public Health. He has served in the United Nations World Health Organization for the Safe Surgery Saves Lives initiative and was named one of the most influential people in healthcare by Health Magazine. He grew up in Danville, Pennsylvania and holds degrees from Bucknell University, Thomas Jefferson University, and Harvard University. His influential book, Unaccountable: What Hospitals Won't Tell You and How Transparency Can Revolutionize Health Care, became the inspiration for the TV show The Resident. He has appeared on NBC and Fox News and written for numerous, national media outlets. Healthcare is a black box of secrecy to most of us common folk. From understanding the prices of procedures to the ever-changing hospital arms-race to the quagmire of public/private insurance plans, most of us just grin and bear it. But from the inside, Dr. Makary has been laboring to reform the culture of medicine on behalf of all patients. Join us for this crucial convervation with one of the world’s leading surgeons who is also a winsome and dynamic communicator.